Erwan Faiveley, 7th generation of the Faiveley Family, hosted the annual Domaine Faively Autumn Shoot at the West London Shooting School on Monday 9th October. 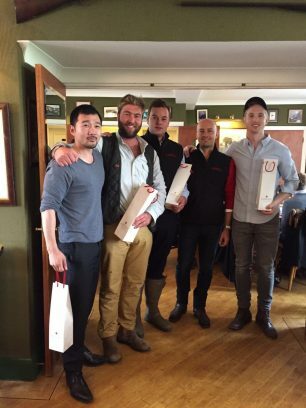 9 teams competed for the Team Top Gun Award, which was claimed by George Burrough´s team of Stephen Tozer (Le Bab), Andreas Rosen (Ormer Restaurant) and Oliver Gladwin (Gladwin Brothers), the latter picking up Top Male Gun. Top Female Gun went to Abagail Freidman of Cru London. Guests were treated to a delicious lunch from Le Bab, accompanied by the wines of Domaine Faiveley including back to back vintages of Corton Clos des Cortons Faiveley. For further details please contact Christine.